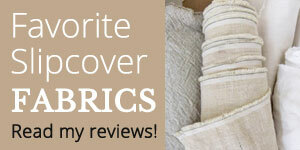 When it comes to slipcover fabrics are you drawn to prints or do you prefer a solid color? I like both but more often than not I choose a neutral solid. It acts as a blank canvas and makes my slipcover super versatile. I think of a neutral color as quite, soothing and easy to live with. By contrast, a fabric print comes with its own unique personality. It gives a slipcovered sofa or chair a distinctive style, which could be the perfect focal piece for your space or just a fun accent. Either way, the beauty of a slipcover is you can enjoy a fabric print for as long as you like and then swap it out for a solid….or the other way around. For this slipcover copy my customer, Maura, sent me her bold abstract print slipcover to copy in a creamy white denim. You can see how going from a print to a solid completely changes the look and mood of her sofa and living space. This entry was posted in denim slipcovers, slipcover copy, sofa slipcovers and tagged white slipcovers on July 27, 2017 by slipcovermaker. Wow! That’s an amazing transformation. Beautiful job!